Cooking with spices is the perfect way to add extra flavour with no extra calories. Spices can also have a good effect on your body, with parsley, turmeric, garlic and ginger particularly well known for positive health benefits. Learning to cook with spices in your kitchen is easy once you know what types of spices go with different types of dishes. However, there is nothing wrong with experimenting with random flavours – you never know, you may come up with something wonderful! Many different countries cuisines rely on certain spices to give their traditional dishes an authentic flavour. Thai cooking, for example, uses lemon grass, lime leaves, fresh chillies and star anise to give Thai curries their distinctive, aromatic quality. If you are keen to get an authentic flavour to your international cooking, it is worth investing in some decent spices – although it doesn’t have to cost a fortune. Buy small amounts of fresh spices from an oriental supermarket and replace them often to keep the flavours at their best. Spices are the perfect partner to roasted, seared and stir fried meat. You can also make a really authentic Thai omelette by frying some pork mince with some fish sauce, chilli, sugar and lots of coriander. Add in two or three whisked eggs and serve sprinkled with chopped peanuts. Spices such as turmeric, garam masala and cumin are really delicious cooked with chicken pieces, a tin of chopped tomatoes and simmered until the sauce is thick to make a simple, weekday curry. Serve with plain boiled basmati rice and maybe a side dish of wilted spinach. Although fish is usually more delicate than meat, it can be complimented by the right spices. Gentle curry spices work well with fish, especially in Goan style curries with coconut milk. 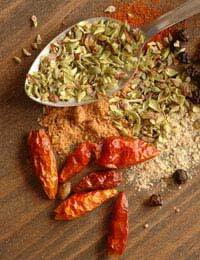 Try making spice rubs for fish and then quickly grilling or barbequing the fish. Aniseed flavours like fennel work well, as do lighter spices such as paprika – just don’t use too much! The right spices can turn a plain vegetable dish into a feast fit for a king! Roasting butternut squash with a mixture of chilli, fennel seeds, cinnamon and cumin makes a wonderful side dish to go with chicken wings or lamb chops. The leftovers also make a scrummy soup, liquidised with some chicken or vegetable stock and coconut milk. You can also roast a tray of vegetables with any number of complimentary spices to either serve as a side dish, use as a filling for jacket potatoes or to make into a healthy soup. By using more spices in your kitchen you will learn how to turn common supermarket ingredients into more exotic meals, simply by knowing which spices compliment your dishes.